About three hours after a former Minister of Aviation, Femi Fani-Kayode, arrived at the Police Force Headquarters, in Abuja, for interview over alleged conspiracy, criminal and inciting publication, he is yet to be released, as at time of filing this report. After obliging to the demand of the police operatives, the minister was then led to the office of the Inspector General of Police Monitoring Team to meet with the Commissioner in Charge of the unit, Habu Sani. Sources told Daily Sun that Fani-Kayode’s invitation might not be unconnected to a petition written by a traditional ruler who is also in the office of the IGP monitoring unit. It was gathered that the IRT boss briefed the former minister about the petition and introduced the traditional ruler who was already seated in his office to the former minister. The two were said to have exchanged pleasantries after which the former minister was said to have asked his personnel aides except to excuse them. At the time of filing this report, the minister was yet to come out of the complex which has already being besieged by journalists waiting to interview him on the outcome of the invitation. The letter had directed the former aviation minister to report to the police in Abuja on Monday, August 27. 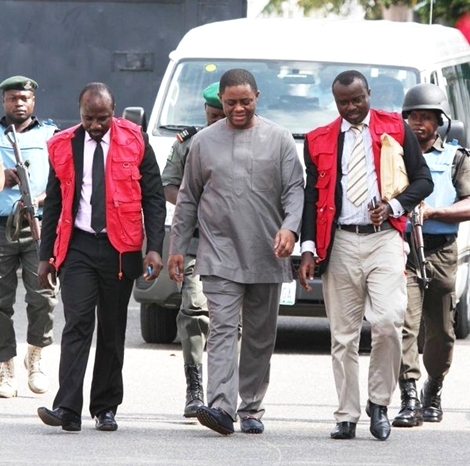 However, Fani-Kayode had also asked the police for a change in date for him to appear before it. He said the change of date was to enable him attend to the just concluded conference of the Nigerian Bar Association (NBA), in Abuja. Fani-Kayode had, in his letter to the police, signed by his lawyer, Kayode Ajulo, stated that the police invitation letter appeared ‘vague and ambiguous’, noting that there was no mention of the complainants and the subject matter of the planned interrogation.